Valerie: It is the 7th of April (a Tuesday) and we are speaking from Montignac, France (near Angoulême). 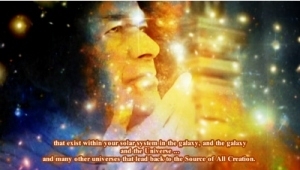 And we are calling upon Cosmic Sai Baba to make His presence and to give us a message for this day. And we welcome his presence. ❝I am here! I am here, my dear and I am very glad to be here among you. Very glad indeed! And I know there has been much talk today – and I have been listening – for I have been present, also. I welcome the opportunity to come, and to listen; for I learn also from the way people are thinking! It is possible to read people’s minds. And I do not want you to freak out about that. But there is a method of use that is related to the Source of All and it is knowing the way people think and being aware of this and not to make a judgement – but rather to assist – to assist the little earthling that is on the planet Earth. And one … that needs assistance from time to time – and I am sure you will agree with me on that. It is a little hard sometimes to know what to talk about. But Valerie has been talking about many things and she is a little concerned about the state of the Earth as all of you are. And I have said that the people on Earth appear to be in total disaster at this time. But if you were to look at – shall we say – the overview of what is happening, you will see that there is a lot being achieved. Also very different from the Earthman’s thinking. In other words it is not readily thought that hundreds of people should die to prove a point or to change an energy but unfortunately that is what is needed upon this Earth. And so there are many souls that have come and volunteered to actually leave the Earth at this time to help raise the consciousness. For it is, as you know, your Easter time – and your Beloved Jesus did just that. It is about raising consciousness. And for those that want to continue assisting the Earthling, they can come back again – in another body – as a Soul, the same soul, that comes back as another being, another personality perhaps, and another agreement about how the life will be lived. But it will continue. And this is the scene. The Earth-race is one that is continually changing. And we in our own way are trying to foster changes so that all the people upon this Earth come to really understand what true peace on Earth is, and what it means, and how to go about it. And so I have not come to preach today. In fact, I do not want to ever preach. I am only speaking from my observation and from (the observations of) those that work with me in the World of Light. We, have been known to be referred to as “God Beings”. That is not exactly who we are – if you would think of us as “the Creators” – although we are able to use that energy and help create! But, it is always done with permission. And this is what I would like you to understand. That anything that is done – is done with permission from the Source – then this is the way it is meant to be. And it is blessed by the Source. The Source of God – the Creator. And I use the word God! Some people are not happy about that for there are many things that have been done “in the name of God” that have nothing to do with God at all. For God is Love. The Universal Love. I would like you to remember that. And all else flows from that. There are many that are coming voluntarily into a body – with an exchange of souls – and this has been spoken about before. Because they come, they come with knowledge and understanding; they also come with a certain amount of power that does help the change – the Earth, the energies that exist upon the Earth – to transmute the energies so that it will not be needed – and to move forward with the changes – of the environment of Suns, the Core of Suns – that the Earth planet is moving into along with the Solar System, its Sun, and other suns that link back to the Source of All Creation. So I would like you to think about that, if you would. I send my blessing and my love to all of you; to all those who are reading my words, and I hope that they will feel — feel the energy of love that comes from the point of the Source of All and it flows freely through me and I wish it to flow freely to all of you.